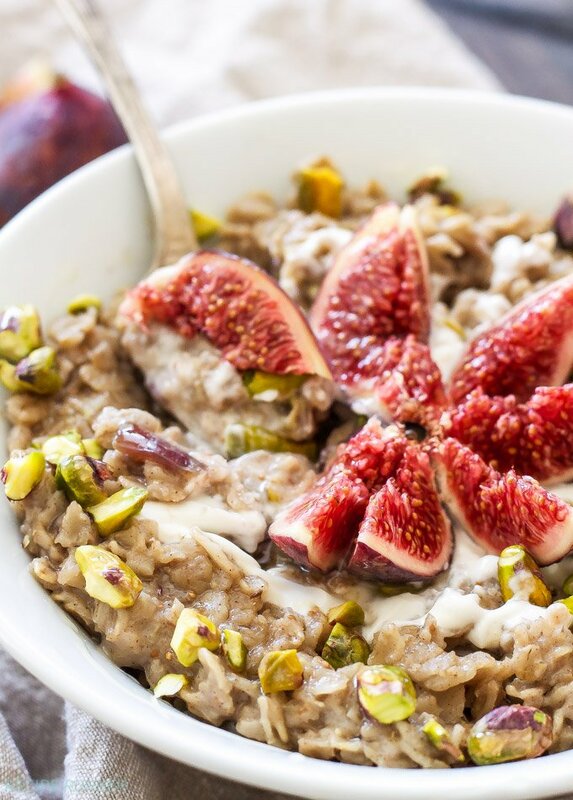 Take advantage of fresh figs and use them in this Vanilla Fig Oatmeal with Pistachios and Honey. 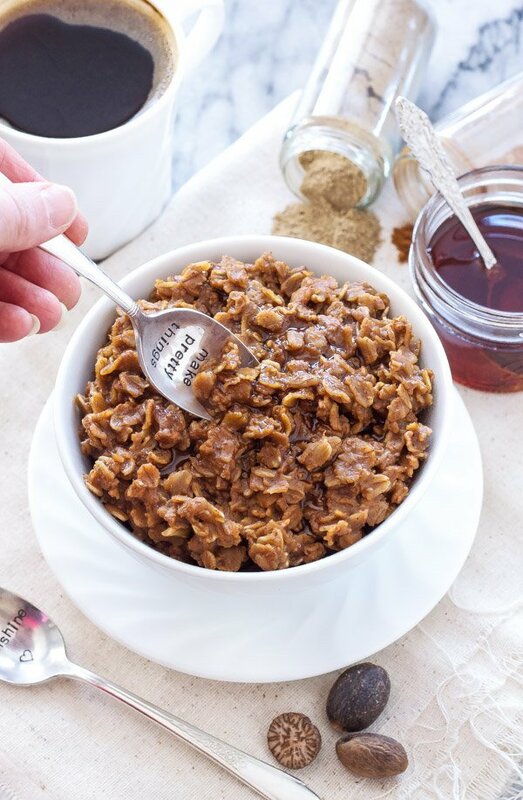 A naturally sweet, gluten-free breakfast that will keep you full and satisfied all morning! Fig season is finally here! I used not give two hoots about fresh figs and had no idea when the season even was. The only thing I had ever eaten with figs in it was a Fig Newton. Then there was that magical moment when I bit into my first fresh fig. I had no idea what to expect, but my hopes weren’t very high. Let’s face it, they aren’t the most attractive looking fruit. The thing about fresh figs is, their beauty lies within. When you cut one in half you’ll find yourself staring a beautiful wine colored interior, probably not what you were expecting looking at it’s purplish-brown skin. When a fresh fig is picked at it’s peak, it’s one of the sweetest fruits you can eat. If you have a fig tree you know all to well that you’ll be battling the birds for the ripest figs. When I lived in Arizona, I used to walk past a house with a fig tree and I always wondered why it was covered in netting. Well now I know, birds! 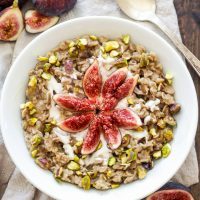 While eating figs fresh from the carton is my favorite, I do like to experiment with them like I’ve done with this Vanilla Fig Oatmeal with Pistachios and Honey. I’ve been on an oatmeal kick lately, it comes and goes with me. I decided fresh figs were the perfect fruit to add in. 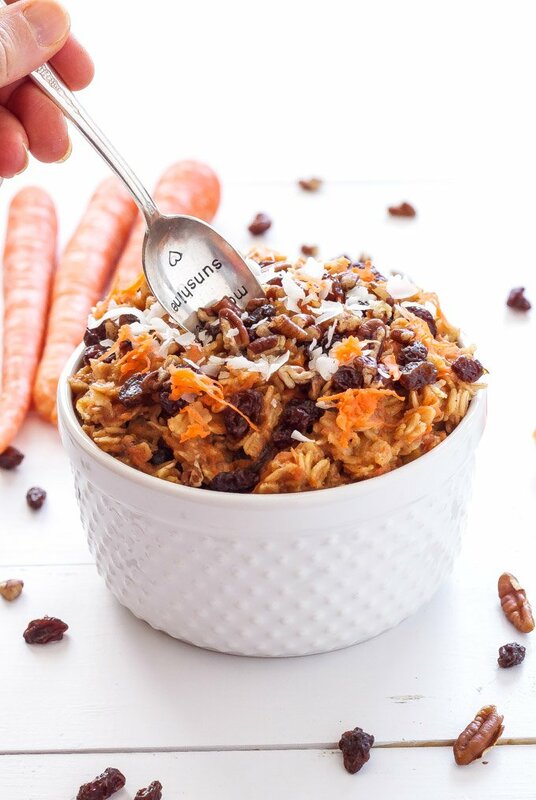 The oatmeal is sweetened with a little honey and of course there is a generous amount of vanilla extract added in. I always like to have some crunch and extra protein in my oats so I swirled in some honey sweetened Greek yogurt and topped it with pistachios and a little more honey. The topping almost has a baklava taste to it. I couldn’t resist adding one more fresh fig to the top which not only looks pretty, but tastes great. 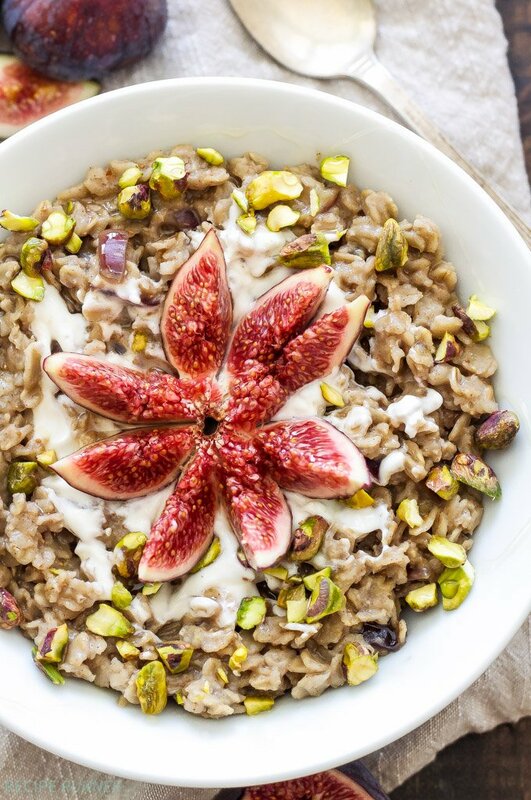 Grab some fresh figs and make this seasonally inspired oatmeal for breakfast before they’re gone for the year! In a small saucepan over medium heat bring the milk to a simmer. When the milk starts to simmer stir in the oats, cinnamon and pinch of salt. Turn the heat to medium-low and let the oats cook for a minute. Add in the diced fig and honey and stir again. Cook the oats until most of the milk is absorbed, 4-5 minutes, stirring occasionally. 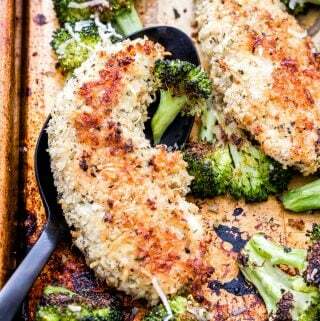 Turn the heat off, stir in the vanilla extract and cover the saucepan with a lid for a couple minutes while you prepare the topping. 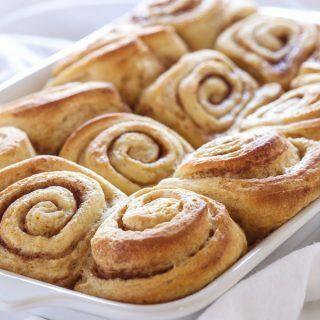 In a small bowl whisk together the Greek yogurt, honey and vanilla. 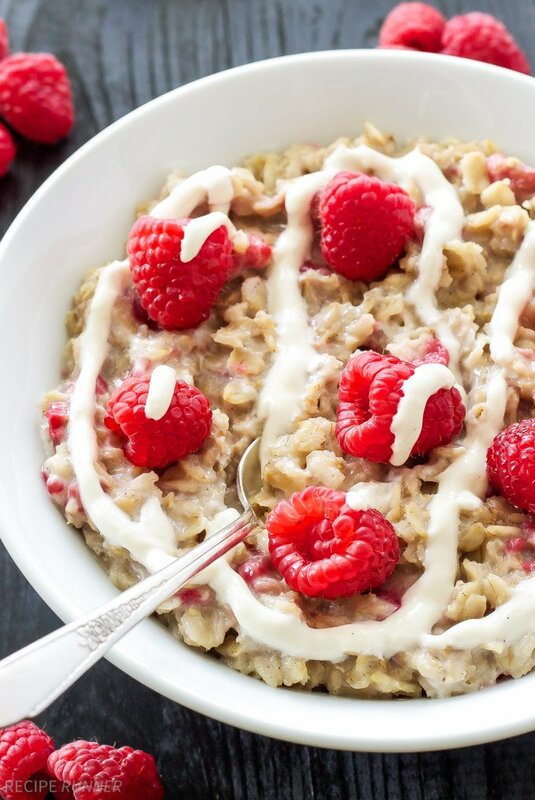 Pour the oatmeal into a bowl and swirl in the Greek yogurt. 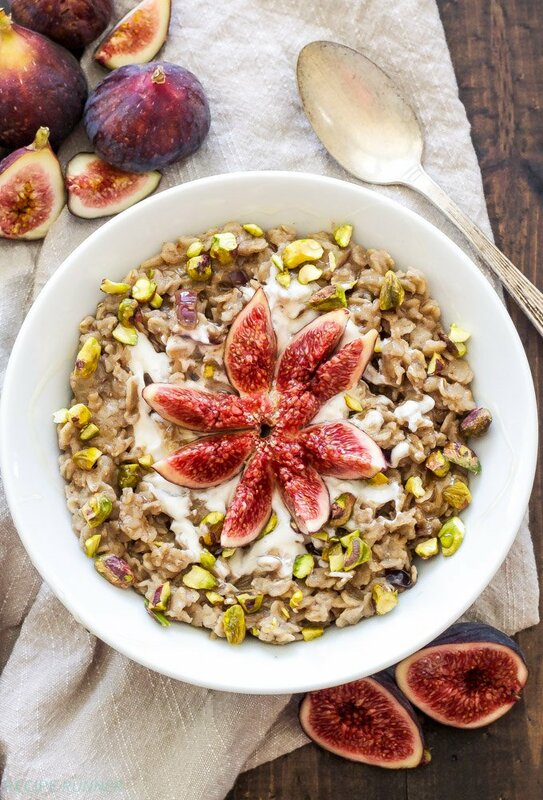 Top with the chopped pistachio, fig and more honey. We're both fig freaks today! ;) This oatmeal is so perfect right now. 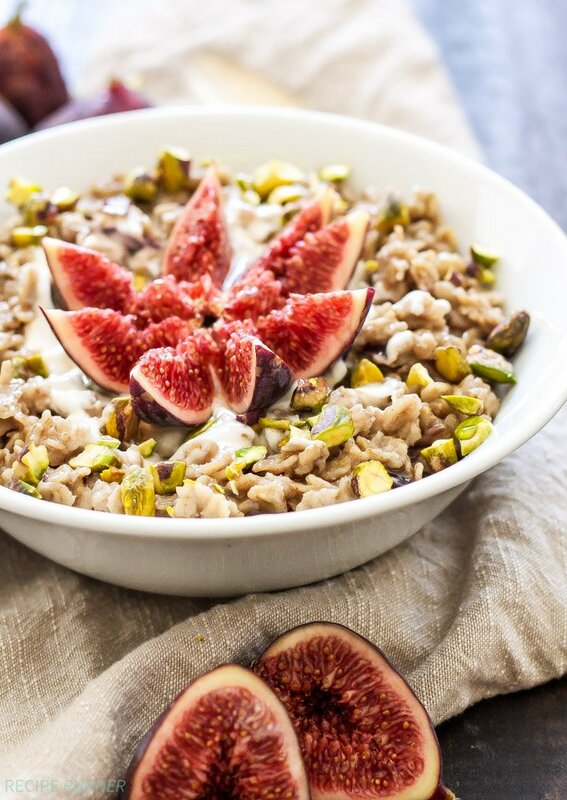 LOVE the pistachios with the figs, for color contrast, texture contrast and flavor! 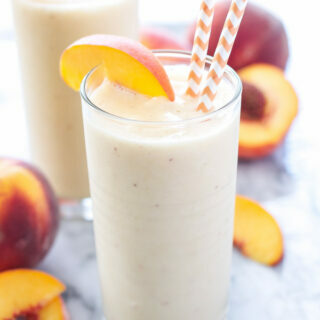 I am absolutely in love with these flavors! And these gorgeous pictures!